Well, I’m an entertainer, a balloon twister, a happy hobo clown, a magician, and I live in Union, Ohio, northwest of Dayton. I service Dayton and SouthWest Ohio and specialize in balloon sculptures. I started out ‘bout 27 years ago by taking a clown class. At first, I was a ‘white face’ clown and then became a ‘happy hobo’ clown. It just sort of fit me 'cause I just don’t get uptight ‘bout much stuff. That’s where the name, Feel N. Lucky the Happy Hobo Clown, comes from; 'cause I always just feel good ‘bout clowning and life. Balloon twisting is my expertise. I love applying my clown humor / magic to balloon twisting. It enhances the twisting and entertains everyone. I have several ‘clown balloon menus’ to choose from. They range from simple to elaborate designs, depending on how many people I’ll be twisting for. Typically, there are ‘bout 50 different choices. Each person gets a free bag for their balloon sculpture, so it makes it thru the rest of the event. I’m an active member of two local clown alleys: Giggles and Grins in Fairborn, Ohio and the YWCA Kazoo Clowns in Piqua, Ohio. In addition, ‘bout 19 years ago I came up with a thirty-minute magic/clown show to go along with the balloon twisting. The magic has lots of audience participation. Usually one of the kids comes up and bails me out when I goof up the trick, and the magic show always ends with a balloon launch that is a big hit. 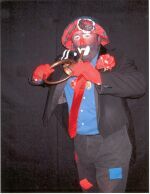 I have done all sorts of different clown, magic, and children’s birthday party gigs in and around the Dayton area. Some examples are West Milton Quaker Heritage Festival; West Milton July 4th Festival; numerous Kettering Recreation Center events; St. James / Resurrection Festival; Miami County Fair; Piqua Miami Valley Centre Mall; Eldora Speedway; Bethany Village; YWCA; & Night Out Against Crime.